Homesite Crowston is a very large area that extends from the Homesite Creek area over to the northeast area above Trout Lake and along Halfmoon Carlson FSR Crowston Branch. It is networked with many logging roads and spurs, but only a few trails. These trails are some of my favourites though and make a nice way of traveling from the western end of the coast to the Sechelt area. To view the BC Timber Sales logging plans for the Homesite Creek area (above Hwy 101) click here. Click here to open a higher resolution pdf version of the map. 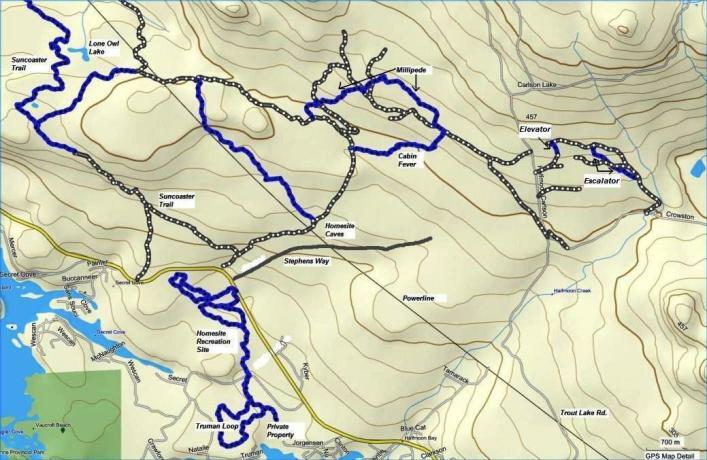 Click here to return from the Homesite Crowston map to the Halfmoon Bay trail descriptions. Click here to return from the Homesite Crowston map to the Home page.